This PGS Legacy Big Sur 51-Inch Gas Grill features a 304 grade stainless steel exterior, four 25,500 BTU heavy duty stainless steel burners that push 102,000 BTUs of total cooking power on the grilling surface. The 14,000 BTU ceramic infrared backburner delivers cooking flexibility, and the heavy duty rotisserie motor, spit rod, and counter balance is capable of supporting up to 15 lbs. The ceramic Moon Roks with stainless steel rock grate provide even heat and perfect smoke control, and the 5/16 inch stainless steel rod cooking grids with Vari Grid spacing offers grilling versatility across 960 square inches of main cooking area. Grill also features the Sure Start continuous spark electronic ignition, convenient lighting tube for ignition backup, and a 336 square inch stainless steel warming rack. The PGS Gas Grill cart features all stainless steel construction, double access doors, two access drawers, pull out propane holder, four swivel casters, and two fold down side shelves. Grill includes propane regulator and 16-inch hose. IMAGE SHOWS ONE SHELF. TWO SHELVES ARE INCLUDED. 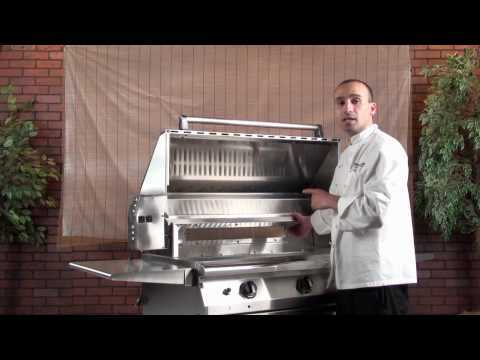 I was looking for a large, quality grill that would produce pro results, and the PGS was it. 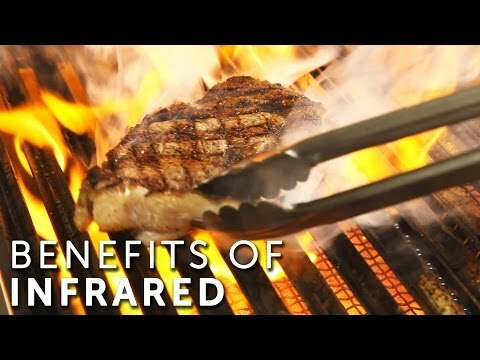 I have loved my new grill since receiving it and cook on it almost every night! No issues with it so far, and with the way it is constructed, I don't expect any! The guys at BBQguys was great and helped me decide on a grill that I am very pleased with.